Hey everyone, it's Deanna back with another inspirational post for you all using the wonderful dies from Dies R Us. Here is what I have for you today. My card base is light blue card stock cut and folded to make a 4 1/4 X 5 1/2" card base. Next I die cut the Stitched Lattice Background Die from Memory Box out of some light yellow card stock. I attached the background to my card base. I then cut out the Arin Bird and the Arin Bird Background dies also from Memory Box. After adhering the two layers of the bird together, I adhered my bird to the lattice background using some foam tape. All my die cutting is done using my Sizzix Big Shot machine. To finish the card, I randomly added some sequence to my card. I stamped and embossed my sentiment with WOW embossing powder and attached the sentiment to the card directly with some adhesive. Adorable! I love the fresh color palette you used for this sweet, sweet bird card! Beautiful background die, pretty colors, fantastic bird! Great card! Beautiful, I love the stitched background, pretty design in the bird and lovely color combo, sweet! I love this card! It makes me want all the dies you used. It's wonderful! 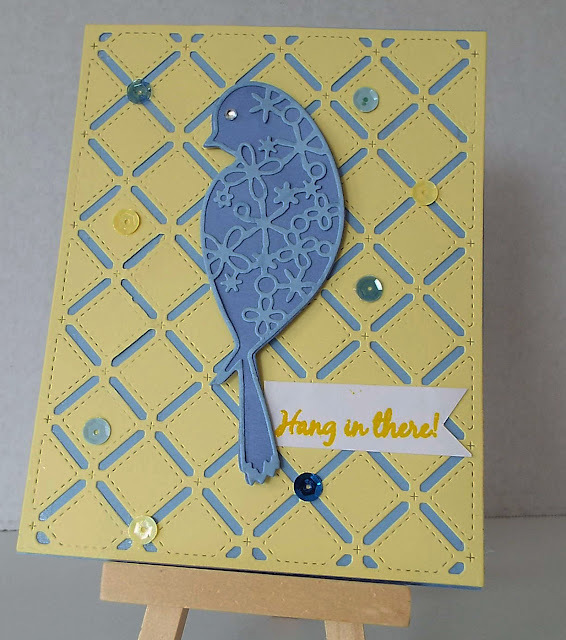 Lovely card, I really like the stitched background and the bird dies. Pretty colours you have chosen.